This review is based on a .pdf copy supplied by the author. There is a link to the author’s website in the back. Links in .pdf’s are not clickable on a Kindle, but will work from a desktop computer. This book has both beginning and intermediate level magical practices in it. 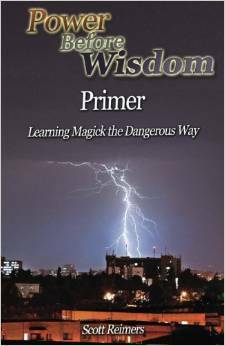 Beginning level magic includes grounding, shields, and other basic practices. However, it’s not aimed at beginners. One thing that really resonated with me was that “the basics are the secrets.” More advanced magic users can get more out of the basics than they got the first time around, and should revisit them. New levels of understanding come from more practice and more openness to experience rather than more new techniques. Another thing that had me nodding was that using magic casually can screw up your life. Magic should be approached with caution. “Power before wisdom” means learning by experience, and sometimes trial and error can lead to really unfortunate errors. The author says that means one should put up with flawed teachers. I don’t completely agree, because sometimes students put up with things in order to learn that no one should have to put up with, but my personal experiences were probably very different from the author’s. Because a lot of the book is about the author’s experiences, I found myself reacting to it as personal story as much as instruction. I liked that, because it showed life with magic, not just magic in isolation. There were several things in the book that would be very helpful for beginners in the magical arts. I know a lot of people were not raised to believe in magic or land-spirits or other noncorporeal beings, so the parts of the book that discuss how to deepen one’s belief would be very helpful to them. The book includes several exercises to help people figure out what they feel about things, including muscle testing and pendulum swinging. These could be useful for those who do not yet have access to the awareness to directly use their intuition. I come from a completely different magical background than the author, so although some things were familiar to me, other things were really eye-opening. I am heathen, and heathenry does not have the Law of Silence, so although I’ve heard people from Wiccan and Ceremonial Magic backgrounds mention it, I never knew it had any actual magical use. I always thought it basically meant being in the closet. I thought its function was the same as a fake internet name, to hide from bigots and protect oneself from bad governments. The idea that skeptics viewing one’s magic could affect one’s magic just boggled my mind. The idea that skeptics viewing a recording of one’s magic could retroactively affect one’s magic is a totally alien concept to me. So, the Law of Silence is actually supposed to help your magic work. Now that I have heard what those who believe in the Law of Silence actually think it does, I will be far less likely to roll my eyes when I see someone on a heathen forum who has newly come over from Wicca talk about it. I had to smile at the advice about visualization where the author recommended reading fantasy and science fiction books, not only because I write that myself and my job is in the genre publishing industry, but also because over the years I’ve gotten a lot of really good magical information and advice from fantasy novels. It’s easier to find the information now, but a lot of older witches learned about grounding and shielding and other magical techniques from fantasy novels. Yes, do read sf & f! It’s not only good for your imagination, it’s fun, too! Another thing that had me nodding in agreement was the discussion of the ethics of compulsion. Also, I, too, have found that the exact same words, with different intent, do different things, or no thing. Spellcraft is not about rote repetition of the right words. It’s about the mind, not outward symbols. There is a whole lot of information in this book about how to practice magic beyond the green-candles-for-money level, when one comes to the understanding that magic is imagination with intent. Some things I related to and some things I didn’t, but that is to be expected. I recommend this book, especially for students of the same magical background as the author who are ready to go beyond the beginner level. I also recommend it for those of non-Wiccan magical backgrounds who interact with Wiccans, to promote cross-cultural understanding.